LONG BEACH, Long Island (WABC) -- A videographer captured the exact moment a bolt of lightning nearly struck beachgoers in Long Beach Thursday. That evening, Jason Belsky had his camera drone flying over the ocean to film the New York Surf Week finals. 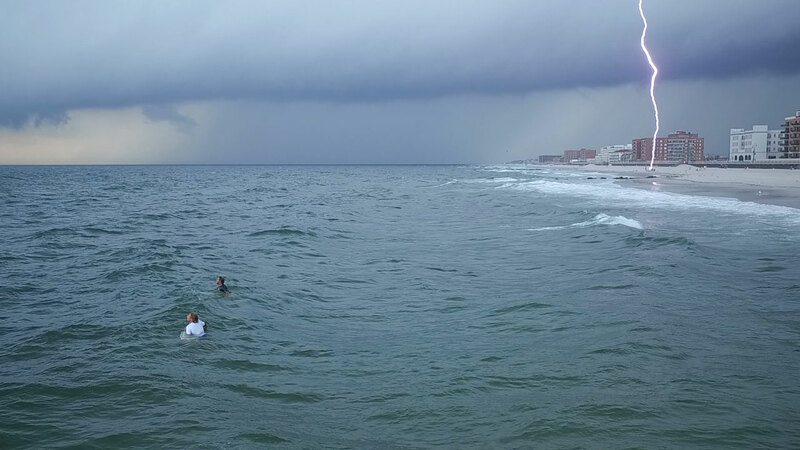 As he waited for the two pictured surfers to catch a wave, a lightning bolt struck the beach behind them. Three lifeguards and two patrons said they felt the impact of the bolt's aftershock. One patron was transported to the hospital, but no one was seriously injured. Paul Gillespie, Chief of Lifeguards in Long Beach, said lifeguards attempted to clear the beach as the storm rolled in, but civilians evacuated slowly, as they didn't take the threat seriously. "These people are very lucky," Gillespie said. "When lifeguards tell you to do something, we are doing that for a purpose. We are trying to save your life."